This item is an online promotion and not displayed in the store at this time. All of our products are sold exactly as described and sold with money back guaranty. Please note that the order time is 6-10 business days from the invoice date for either pick up in the store or for delivery if requested for a fee. 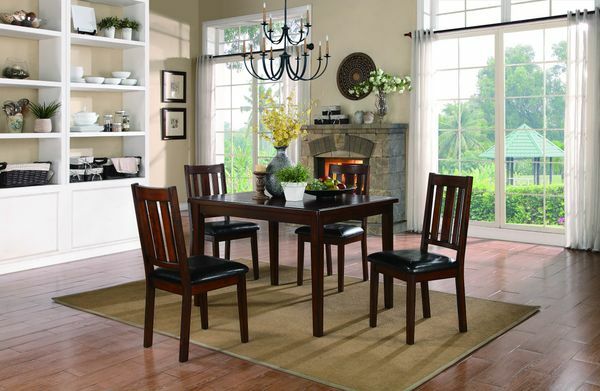 Designed for your cozy dining nook; the transitionally styled Mosely Collection will be a perfect fit. Vertical slat back chairs - featuring black bi-cast vinyl seating with contour stitching flank the routed tabletop. 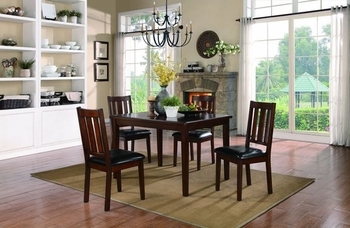 The collection is offered in a dark brown cherry finish.